Born in Blackburn and raised in Southport, Lee Mack started in comedy after a series of casual jobs, including stableboy and working in a bingo hall. His first taste of stand-up came as a Pontin's bluecoat. His frist experience of the wider circuit came in 1994, when he did his first open mike slot while a student at Brunel University, West London. Within 18 months, he had won the So You Think You're Funny new act competition at the 1995 Edinburgh Fringe and become a full-time comedian. In 1996, he returned to the festival as part of an ensemble show, Gagging For It, and the following year he performed the solo show Return Of The Mack. He had some level of fame by then, having hosted the Channel 4 stand-up show Gas, but found the experience of performing alone disheartening. So in 1999, he teamed up with Catherine Tate and Dan Antopolski for the Fringe sketch show Lee Mack's Bits, and the 2000 follow-up was nominated for the Perrier. On the strength of that, Mack became one of the key players in ITV's The Sketch Show, which ran from 2001 to 2003. He was the only member of the UK cast to feature in the short-lived American remake, introduced by Kelsey Grammer, in 2004. The following year he landed the job of host on BBC One sports quiz They Think It's All Over, taking over from Nick Hancock. But the programme was cancelled after one series with Mack in the chair. He then moved to sitcom, premiering the traditional studio-based Not Going Out on BBC One in October 2006, at a time when that style was thought to be dead. The show returned for a second series in September 2007 and a third in January 2009. It has won Rose d'Or and Royal Television Society awards. Mack is also a team captain on the BBC One panel show Would I Lie To You? Revelations in the next Who Do You Think You Are? Lee Mack has discovered that his great-grandfather was not only a comedian, but a soldier who ­survived the bloodiest day in British Army history. The comic has long known that Billy Mac was an entertainer, and owns three dog-eared photographs that had been passed down throught the family. But taking part in the BBC genealogy programme Who Do You Think You Are?, he discovered that Billy fought in the First World War. ‘Typically.as a self-obsessed stand-up comedian I've been trying to find about his showbiz life,’ Mack said. ‘But perhaps there's something more interesting and profound I should find out. Further investigation found that he took part in the Battle of the Somme, walking across no man’s land to help take the German trenches. On just one day of the battle, 20,000 British soldiers were killed. Astonishingly, Billy would entertain the troops after taking part in the fighting. 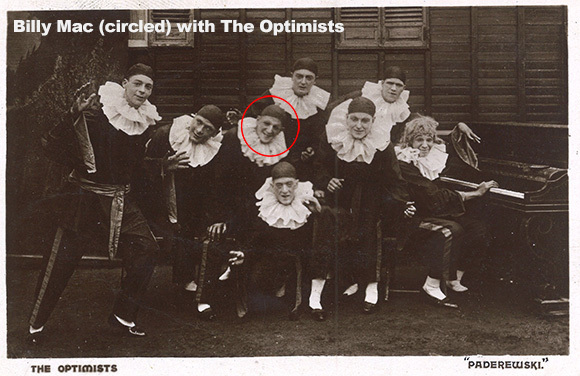 Mack travelled to Ypres where historian Rebecca D’Monte showed him a report of his great-grandfather’s comedy troupe, The Optimists, performing on the front line. 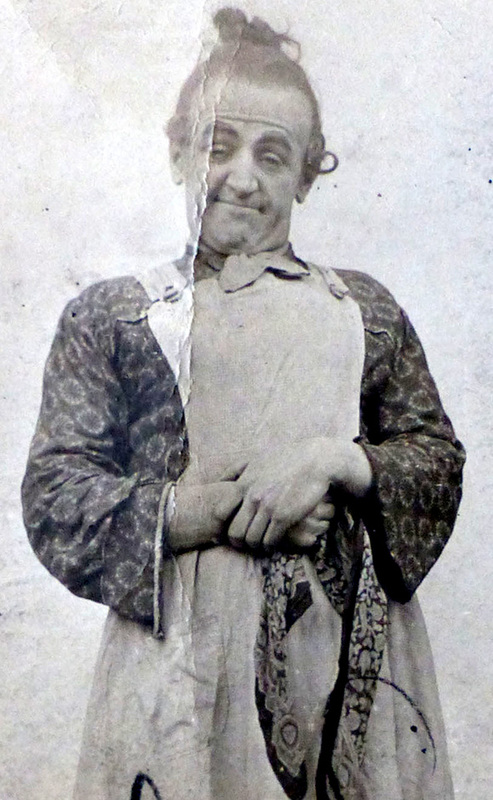 There was no report of The Optimists performing after 1918, but Mack travelled back to his hometown of Southport, where Billy performed after the war both in drag (below) and as a ‘swell’ character – a spoof of a fancy socialite. It appears he ended up marrying an autograph-hunter – Mack’s great-great grandmother Gladys. But Billy did not pursue a long career in comedy. In 1922, the birth certificate of his son describes Billy as a maker of wireless equipment. The Not Going Out star was also surprised to learn that Billy, was more middle class than he expected. Billy was one of first middle-recruits into the 17th battalion of the King’s Liverpool regiment, a so-called ‘pals battalion’, of men from similar backgrounds. However, Lee rejects the idea that being funny is genetic, saying: ‘I think it is more likely it’s about upbringings. In his episode of Who Do You Think You Are?, which airs on BBC One next Monday, Mack also investigated why his maternal granddad Joe was sent by his mother to be brought up by his grandparents in Ireland. We do not currently hold contact details for Lee Mack's agent. If you are a comic or agent wanting your details to appear on Chortle, click here.